Journalism Tips: 57. Lessons from the movies - what sells well. Stories about institutions can often read very dry - hence there is less (not necessarily no) interest in them. People like to read about people. It is a simple fact of life. Always remember that. If say writing about a local college transforming itself from a failing institution to an outstanding one consider going in on the headteacher that made it happen or a student who has benefited from the changes. Major roadworks months overdue? Try finding the shop owners who will be affected. If nothing else it makes the photos more interesting - rather than just a hole in the ground. You will find that time restraints will mean that too often you will struggle to find a talking head willing to be photographed... so look out for them when the opportunity arises. 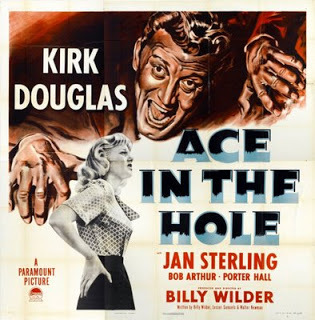 Today's clip comes from the superb Billy Wilder 1951 classic Ace In The Hole. Cynical hack Chuck Tatum brings the circus to town when a man is trapped under a rock fall. Oh yes, and the unforgetable line: "I've met a lot of hard boiled eggs in my time - but you are 20 minutes."